On an emotional evening filled with good-byes to the O’Connell Center for the 2012-2013 season, the Florida Gator men’s basketball team (24-5, 14-3 SEC) ousted the Vanderbilt Commodores (13-16, 7-10 SEC) 66-40 on Senior Night, leading throughout to clinch the Southeastern Conference regular season title. Kenny Boynton, UF’s second all-time leading scorer, Mike Rosario, and Erik Murphy were honored at center court and presented framed jerseys prior to the match-up suiting up as Florida Gators for the final time of their careers in Gainesville. The victory marked the 100th for the senior class. Boynton missed four of his first five shots and Murphy shanked his first two, but the pair of seniors each finished in double figures, scoring 15 and 10 points, respectively to top the stat sheet for the Gators. Junior center Patric Young scored 14 points and says that Boynton’s groove as the game went on instilled confidence in the team. Young was not to be overlooked. Playing in what may have been his last home game as a Gator, he finished in double digits for the 17th time this season, tallying 14 points with four rebounds and three blocks that electrified the crowd and moved him into eighth place all-time on the single season blocked shots list with 51. Gator forward Will Yeguete scored his first points since leaving a February 5th game against the Arkansas Razorbacks with a right knee injury that required arthroscopic surgery in the days that followed. Vanderbilt guard Kedren Johnson continued his strong sophomore season with a team leading 15 points, the only player on the Commodores that reached the double digit plateau in the game. 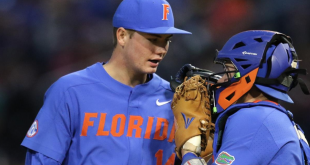 Once again, Florida’s firm defense provided the backbone for a successful performance. Wednesday night marked the fourth time this season the Gators have held their opponent to 40 points or less. UF kept Vanderbilt contained in the first half as well, allowing merely 14 total points in the opening 20 minutes. 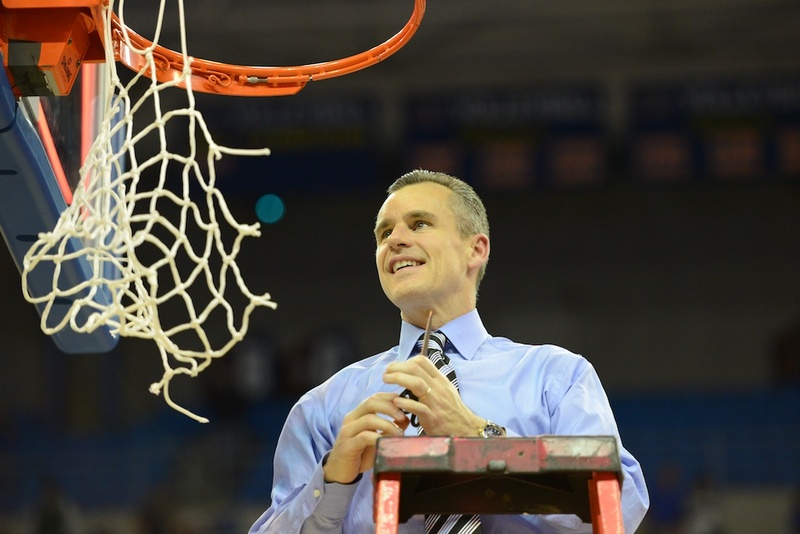 From the onset, the Gators vanquished long range shooting for Vanderbilt. It took the Commodores nine efforts to sink their first three point basket, shooting a lowly 4-24 from outside the arc on the evening. Field goal shooting was equally stagnant, as the Commodores shot 14 of 52 for 26.9 percent. At the end of a low scoring first half, the two teams entered the locker rooms with Florida leading 24-14 with Young scoring 10 points in the opening stanza. Kedren Johnson carried the Commodores offensively, notching 10 of VU’s 14 points. Aided by a 23-4 run that closed out the game, the Gators cruised without a serious challenge in the second half. With approximately two minutes remaining, the trio of seniors were summoned from the court and welcomed to the bench to vociferous roars of approval and a standing ovation from the 10,000 in attendance. 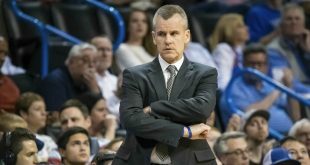 Head coach Billy Donovan acknowledges the overall performance was not one of the team’s best, and hopes to see the team’s surge at the finish continue through40 minutes of play. 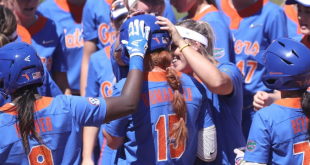 Florida’s regular season SEC title is the school’s sixth overall and one of four championships clinched outright. The win clinched the fourth undefeated season at home in program history, and matched the school record of 14 wins in conference competition. Despite the accomplishment, Mike Rosario acknowledges that the team needs to focus on the future after enjoying this win. 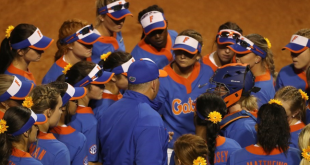 The Gators travel to Lexington to battle the Kentucky Wildcats on Saturday to close out the regular season. Coverage of the season finale begins at 11:25 on Country 103.7 The Gator and continues through tipoff at noon.